Life is full of surprises, some good, some not so good, and some just awesome. This one is in the “awesome” box. Walter Stoller, an older army veteran, had been homeless until Ryan Jacobsen, 46, a retired Navy vet from Wauconda, who works as a case manager for the non-profit organization TLS Veterans, found Stoller a place to live in Rockford with another homeless vet. TLS Veterans stands for Transforming Lives through Service to Veterans. Jacobsen was in the Navy for 20 years, and he understands that often, vets can become displaced and need support. “Sadly, there are quite a few out there,” he said, according to the DailyHerald. Stoller had no way of getting out and about, as he didn’t own a car. That’s when Jacobsen stepped in and organized a special gift for him. Jacobsen and the organization partnered up with RYCO Landscaping, a company that agreed to donate a vehicle. 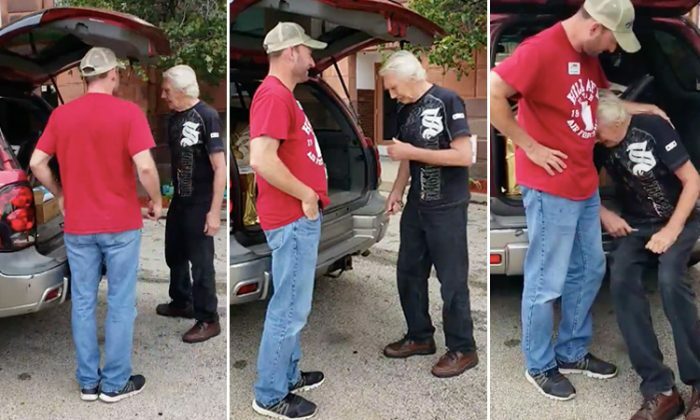 On the pretext of a special delivery of art materials for Stoller, he managed to get the vet outside, and when he presented him with the keys to a brand-new car—well watch his reaction in the video. Today we got to surprise an Army Veteran with a car donated by RYCO Landscaping! He thought we were delivering some canvas for him to do his painting. His reaction is priceless! In another instance, a homeless Navy veteran, Eddie Browning, and his wife, Cindy Browning, were freezing in the cold. They had no money to fix their camper, which was in quite a bad state. Seeing the needy veteran suffer, a group of selfless kids from the Elm Street Elementary in Rome, Georgia, took the matter into their own hands. They started to build a tiny house in order to help save the couple from freezing to death. When the organizers from the Georgia Tiny House Festival at Ooh La La Lavender farm discovered the project, they decided to make the house even bigger with the help of some volunteers. The initial house, which was 4 feet by 8 feet, turned into a beautiful 248-square-foot apartment with all the best facilities like a bathroom, kitchen, and more. When the Navy couple discovered that the kids had done this for them, they had a puddle of tears. I don’t have the words to tell you what we feel,” said Eddie, told Fox 5. “It was a very moving experience, because the kids got to meet the veteran who will live in the home with his wife. They helped make this couple’s home. Their vision came to life,” Assistant Principal Laura Walley told Rome News-Tribune. Kudos to these selfless people for their random acts of compassion.